The age of house flipping may have faded. But the super rich have found a new path to instant profits: flipping their megajets. Demand for the biggest, most expensive Gulfstream (Grey Market: GIGIQ) jet-the G650-is so strong that owners have started flipping them to other buyers. In some deals, the sellers are pulling in profits of between $5 million and $7 million per flip. Billionaire Bernie Ecclestone, the Formula One tycoon, recently flipped his G650 to an Asian businessman for $72 million-at least $6 million more than his purchase price, according to people familiar with the deal. The transaction, first reported by BizjetBlogger, came just weeks after Ecclestone received the plane from Gulfstream. (Ecclestone couldn't be reached for comment, but BizjetBlogger said the plane was too large for some of Ecclestone's favorite airports). 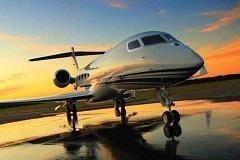 Jet brokers and consultants said at least two other buyers have flipped their G650s recently for more than $70 million. At least two other deals are in the works, they said. One of these is an American billionaire negotiating with a buyer in Asia. The other deals involved billionaires in Russia, Latin America and the Middle East. The flips highlight the strong demand for large-cabin planes-the biggest, most expensive private jets-at a time when the rest of the private jet market is still languishing. Business jet deliveries are still down more than 30 percent from their peak in 2008, and prices for some planes have fallen by more than half, brokers say. But large-cabin planes are a hot commodity among billionaires and global companies. With their long range and ample cabins, they can carry more passengers over longer distances and in greater comfort. The G650, with a base price of $64.5 million, is the king of the large-cabin private jets, with a range of well over 7,000 miles and a maximum speed of Mach 0.925. The G650 also is very scarce. Only around 30 to 35 have been delivered since its launch last year, according to brokers. Still, the jet has become the must have plane for the world's billionaires, with Ralph Lauren and Oprah Winfrey both lining up for one. Demand is so strong that a buyer signing a contract today won't get their G650 until the third quarter of 2017. That's why many buyers are willing to pay more than $70 million to get their planes today. "These are billionaires who are willing to pay a premium to avoid the wait," said Philip Rushton, founder of Aviatrade, an aviation consulting and brokerage firm. The deals are a double-edged sword for Gulfstream. While they highlight the strong demand and value of its aircraft, they also show that customers are now making millions off of its product. The company said that it is "not privy to the details" of any flips, "if customers are, in fact, getting a premium for the aircraft, it's a testament to the amazing capabilities of the G650." The real problem for Gulfstream is clients trying to sell their planes before they are delivered. Gulfstream said that "Customers cannot sell the aircraft before they've physically taken delivery of it. This prevents speculation, which isn't good for the market." The company has a "non-assignability" clause in its contracts, meaning the ownership can't be reassigned after a contract is signed. Some customers tried to get around the clause by buying the plane under the name of a newly created aviation company. They would then sell the company to a new buyer, essentially transferring ownership of the plane through the company sale. Brokers said Gulfstream caught on to the game and is now requiring the signer of the contract to be involved in the final delivery. "They're really doing their best to deter this," said Jay Duckson of Central Business Jets. -By CNBC's Robert Frank. Follow him on Twitter @robtfrank.